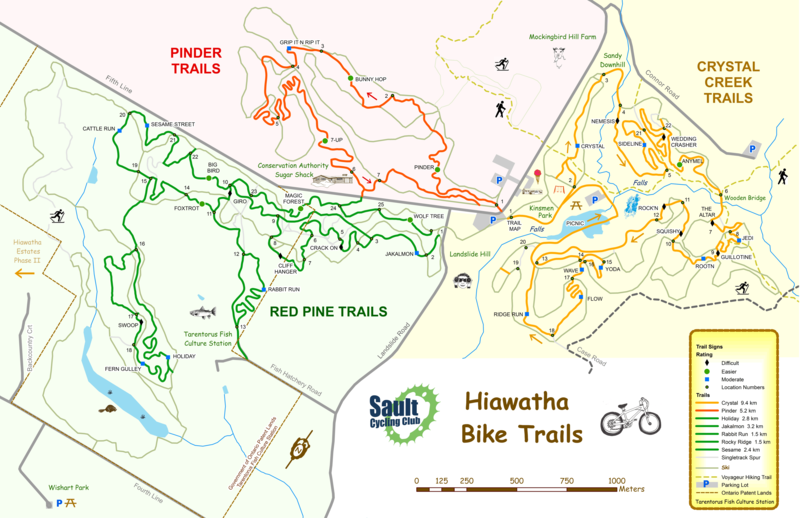 Here are the local bike & ski trail maps in and around the Sault Ste. Marie area. If you are new to the area or an avid outdoor enthusiast, check out the trail maps and explore what Sault Ste. Marie has to offer! 30 km of single track mountain bike trails ranging in difficulty from beginner to expert. Trails consist of fast, flowy, technical, and easy to ride sections and everything in between. 45 km of cross country ski and snowshoe trails that cater to beginner and advanced skiers – day passes are required. 22.5 km of multi-use trail to cruise around Sault Ste. Marie for commuting to work, checking out local shops or just enjoying being outside for the day. Stokely has over 100 km of ski and snowshoe trails that cover King Mountain and surrounding area – day passes are required. In the summer, Algoma Highlands Conservancy has 12 km of single track mountain bike trails that traverse King Mountain. There are plenty of groomed fat bike trails in and around Sault Ste. Marie! Here is a map showing which trails are typically groomed in the winter months. 380 km of road and trail for cycling, hiking and walking that spans from Sault Ste. Maire to Sudbury.